CHOOSE SILVER OR GOLD TEXT! Louisville Slugger Custom Youth Wooden Baseball Bat - Black. Black finish with silver or gold imprint. Recipient's name is engraved in the identical fashion previously reserved solely for Major Leaguers. Up to four lines can be personalized - maximum 24 letters and/or spaces per line. Souvenir bat for display...not intended to be used to hit baseballs. 30" length. Choose silver or gold imprint. Please enter the text you would like engraved on your bat. Most orders include GENUINE on line 1 and LOUISVILLE SLUGGER on line 4 with one or two lines personalized in the middle...unless you want all four lines personalized. Please note: We are not permitted to engrave Professional Ball Player�s names, Professional Team Names and/or Registered Trademark names (for personal use). 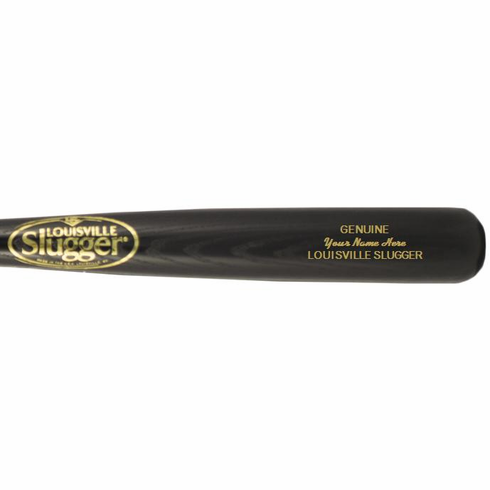 Click here to see all of our Louisville Slugger Gift Items! Regular shipping - your bat order will ship UPS Ground in appx. 3-4 weeks. Rush shipping - you can pay $5 extra per bat and your bat order will ship UPS Ground in appx. 5-7 business days.